← Lordy, Lordy, etc., etc. The Blade Itself follows the fortunes of several unsavory characters as they make their way to the city of Adua, all while war with the northern barbarians looms over the land. Logen Ninefingers, Northman and “named man”, has run out of luck. Left only with his life and reputation, he finds himself caught in the machinations of a mysterious and eccentric Magus. Captain Jezal dan Luthar, selfish dilettante soldier and master swordsman, discovers that he is not only in love with a commoner, but is about to be sent to bloody war in the North. Ferro Maljinn, former slave with little more than murder and vengeance on her mind, is lead toward a new purpose by a mysterious benefactor. Finally Sand dan Glotka, a hideously crippled and embittered Inquisitor, has tortured his way into the secret, corrupt heart of the kingdom–if he can live long enough not to be killed by his superiors to report on it. Make no mistake, this is a grim fantasy. The characters, while strangely endearing, are not nice people by any stretch of the imagination. The magic of this world is mysterious, difficult, and infused with a dark sense of cost. Despite the darkness of the narrative, it is apparent that Abercrombie is having fun with his characters. There is a wry humor fused to the noir sensibilities of the text. Further, he draws characters that you can’t help but root for–even though you know that you shouldn’t. The largest criticism of this first book in a trilogy is that its ending is ultimately unsatisfying. The entire narrative is a set up to get the characters where they need to be for the next book in the series. As a result, the reader gets the sense that not a great deal has happened. Sure, there’s been a dueling contest and some encounters in a magic tower, but it is all set-up for what is to come. The various point-of-view characters do not even come together until the third act of the story, and then only relatively briefly. Nevertheless, Abercrombie’s talent in creating compelling characters makes you want to see what the next act of the story is going to be. It may be unsatisfying, but the reader is ready to continue the tale. 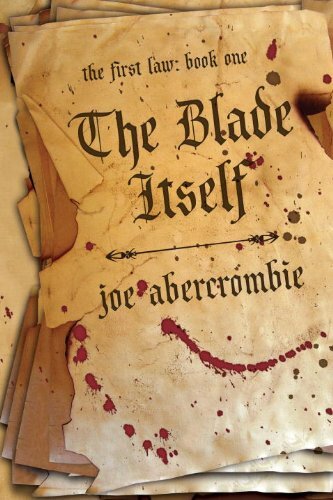 Ultimately, The Blade Itself is a compellingly original fantasy that introduces a much larger, epic story. If you like your fantasy dark and witty, then this may be an introduction to your next favorite series. This entry was posted in Reviews and tagged fantasy, fiction, joe abercrombie, noir, novel, review. Bookmark the permalink. I tried to read The Blade Itself a few years ago. But I stopped after about thirty pages or so. I just couldn’t stand it. I enjoyed it quite a bit, but I have to admit that it took me a little while to get through it. I can definitely see where it is not everyone’s cup of tea.